Since 1979, serving the Consortia. Federdoc is the Voluntary Consortia National Confederation for the Protection of the Italian Wines Designations. Established in 1979, it gathers almost the whole world of Italian wine designations and their Protection Consortia. Every day Federdoc represents and supports the Consortia with every institutional, legal and legislative aspects. Throughout the year it promotes the Designations with informational and promotional campaigns, both in Europe and worldwide. 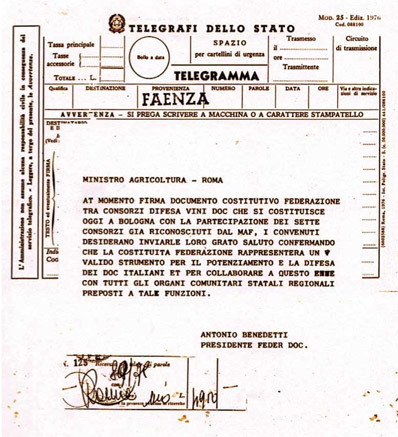 Federdoc: “the Designation of Origin” of Italian Consortia. On July 9th 1979, at the Chamber of Commerce of Bologna, was established the Voluntary Consortia National Confederation for the Protection of the Italian wines, briefly Federdoc. With the term “Designation” are meant all the Protected Designations of Origin and Protected Geographical Indications (DOCG-DOC-IGT) of the Italian wines whose production is monitored by Protection Associations according to D.M. October 5th 2018. The Voluntary Consortia for the Protection of the Italian Wines Designations can gather into regional or/and interregional federations to optimize the pursuit of goals on the areas concerned. Federdoc is the “table” around which representatives of the agricultural, industrial, cooperative and commercial fields of the sector get together to deal with the problems about designations. Together, they seek solutions and guarantee support for international legal protection. 1) Providing legal and legislative support and assistance to the protection Consortia while fulfilling their institutional functions as set by the law. Moreover, providing assistance with the activities on the law about the Designation of Origin and/or Geographical Indication of Italian wines. 2) Concluding, on behalf of the associated Consortia, agreements, researching and studying projects about aspects and topics of national interest referring to Community rules and obligations. 3) Working for the national and international legal protection of Italian Designations, cooperating with the E.C., national and regional organizations by participating in the initiatives about their promotion. 4) Carrying out functions and tasks given by ministries and/or competent ministerial and regional bodies, under their control and coordination. 5) Providing the technical support to create a fixed procedure for the production of both Designation of Origin and with Geographical indication wines. 6) Steering and coordinating the activities of the Consortia, to protect, increase and enhance the image of Italian Designations. 7) Carrying out studies, proposal and collaboration towards legislative and regulatory activities related to the vine and wine, in partnership with Community, national and regional administrations. 8) Safeguarding Italian Designation of Origin wines everywhere and support all the Organizations of Protection. Furthermore, defining the role of the Federdoc in all the decision-making institutions. 9) Promoting and enhanceing the knowledge and the consumer education about Italian wines with Designation of Origin, collaborating with Private organizations and Community, national and regional administrations. 10) Alongside, Federdoc developed over the years some national and international educational projects about Designation of Origin wines, collaborating with the Ministry of agricultural, food, forestry policies and tourism and with the European Community. These projects aim to increase the knowledge about production processes of Italian wines with Designation of Origin, their peculiarities and their bond with the territory, and they are referred to various target audiences: from journalists, to economic operators, to the final consumer.